Lowdown: What will the world be like if all humans were to suddenly disappear? A few years ago I read a book called The World Without Us that was trying to provide a detailed answer to a simple question: what would the earth be like if all humans were to suddenly disappear? I found the idea interesting even if the book’s execution was lacking, and therefore sprang into action when I learned of another attempt to deal with the same question. 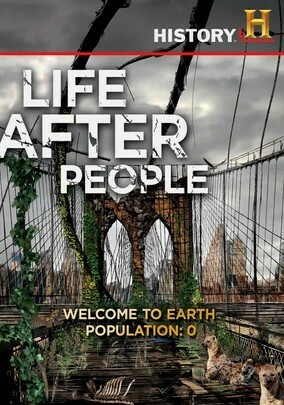 This time it was a 2008 documentary called Life After People. In many respects, Life After People is similar to The World Without Us to the point of me wondering whether they are related in more than the core idea. For example, both bring at their very beginning the example of Manhattan flooding once the pumps keeping the subway tunnels dry stop working. Similarities continues as Life After People moves along, telling us how our world would turn out to be days, months, years and millennia after humans disappear. The bottom line: in not that long a time it would become quite hard to figure out we were ever here through anything other than an archaeological dig. The nice thing about this documentary is that it puts its money where its mouth is and shows us how the world would look like, either through poor quality and repetitive digital effects (boo!) or through real life examples of places people have abandoned (hooray!). Chernobyl serves as a fine example for the latter. Through this depiction, Life After People shows us how fragile human existence is and how important it is for us to take care of our civilization. Alas, all is not well with Life After People. The problem, in one word, is “Americanisation”. Allow me to explain. Life After People adopts a rather annoying style that seems to be catering for the lowest common denominator American viewer. It treats this viewer as if she was dumb. The treatment manifests itself in various ways, starting with the narration that sounds like the voice of the movie teaser personality (“…and this time, it’s personal”) but stretching throughout. Moving on with exaggerated sound effects repeating themselves, as with the annoying demonstration of steel cable breaking under pressure to take our hanging bridges down. Most importantly, the documentary avoids making any statements that require an IQ higher than one’s shoe size to fathom. All the while, Life After People avoids making points I would deem important about matters Americans might find offensive, such as the environment: surely a documentary dealing with the legacy of humans to our planet should tackle our toxic heritage? The narrowing of scope to fit the dumbest ever American ruins things for this doco. Overall: Judging by both book and documentary, it seems as if this is a subject matter rife for abuse. I still consider the core question compellingly interesting, which explains my disappointment and my giving Life After People only 1.5 out of 5 stars.